Everybody has their secrets and Windows has them too.. I've been using these for a while and wanted to share them and I'd like to see some more I don't know yet. 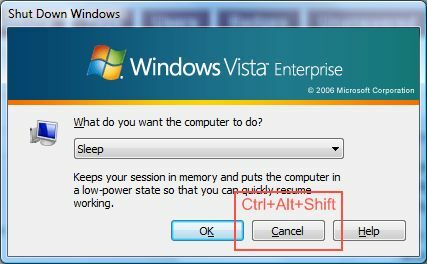 To get to the 'Shut Down Windows' screen in Windows Vista is not straightforward too, and this is how I got there, Ctrl + ESC, Esc, Alt + F4**. This is useful too when you can't see your screen, and if you're lucky enough you can press, R or S, and then Alt + K to restart or shutdown a blind Windows (no screen). Shutdown Windows Explorer: you have to get to the logoff screen then press Ctrl + Alt + Shiftand simultaneously Cancel, that will close Windows Explorer without ending the session. That helped me a lot when some Windows Explorer window goes crazy and doesn't want to respond. I think this has worked since Windows 95, but I'm not sure. Ctrl + Shift + Esc, brings Task Manager to the focus and if it's not running it starts it, this is helpful when you have Windows Explorer closed (the point 1) and want to start a new one, going to file / new task, and running 'explorer'.